Last winter, three other bloggers graciously presented me with blogging awards under the highly flattering (if perhaps misguided) assumption that I am awesome (which I am, though clearly not when it comes to following up on said awards in a timely fashion). While I tremendously appreciated the nods from all three bodacious bloggers, my problem was that I was expected to identify 15 other awesome blogs/bloggers in the course of accepting the awards. At the time, I didn't know fifteen other bloggers. Truth is, I probably still don't, considering that I can't list the bloggers I read most often, since they're among the ones who gave me the awards in the first place. Little paradoxes like this feed directly into the Procrastination Express; now here I am, some 9-10 months later, belatedly trying to accept these honors while hanging my head in shame for taking so long to do so. If it's true that the road to hell is paved with good intentions, then the gates would now be in my backyard and Cerberus would be scratching at my door. Sigh. Anyway, abject apologies aside, let's get on with the actual awards, because they're way more fun. I'm consolidating them here because that's likely the only way I'll get them done and because there's a fair bit of overlap. 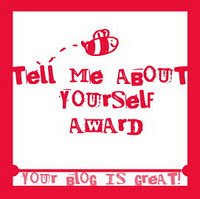 The first award, the "Tell Me About Yourself Award," was presented to me last December by both the lovely Lizanne52 over at Words All Day Thru and the truly awesome Naked Mommy over at Naked Mommy Diaries. How can you possibly NOT love someone who ODs on books or who makes disturbing things out of excess hair and is a Sports Bra Aerobics soul sister? Go read their blogs. Right now. Because they rock. 2. List 7 things that people may not know about you. 3. Pass the award to 15 other bloggers and notify them. 4. 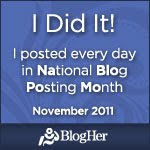 Post the badge on your blog. 1. I can simulate playing "Scotland the Brave" on bagpipes by holding my nose shut with one hand to make a sound like a kazoo and then whacking myself in the throat with the edge of my other hand at appropriate intervals. I learned this disturbingly awesome trick by watching the comedian Bill Kirchenbauer do it on his show "Just the Ten of Us." 2. All the money in my wallet has to be facing forward, right side up, with the bills all in denominational order, increasing from smallest to largest. If someone's head is pointing down or a $1 is swapped with a $10, it makes me twitch. 3. I have been to England, Scotland, Austria, Germany, the Czech Republic, Canada, Hungary (for like half an hour), and the Netherlands (if you count walking through the marijuana-scented corridors of the Schipol Airport). It's not enough--I want to see it ALL now. 4. I have freckles everywhere, even on my feet. And when I was a kid, my dad used to "pick" them off of my arms and put them in his lunchbox for dessert on his way to work. 5. I don't drink coffee (never have) and I don't generally like seafood. I also don't drink because I could never understand the concept of something being an "acquired taste." If something is so bad that I have to "acquire" a taste for it, then what's the point? I'm not gonna waste weeks of my life chugging down bitter coffee till it suddenly tastes good any more than I'm gonna quaff wine by the barrel until it either becomes enjoyable or until I wake up one morning to wonder why I'm naked and my clothes are hanging from the chandelier, stuffed in the microwave, and/or arranged in an artful collage across the trees in my front yard. Frankly, I'm weird enough sober...the thought what I might do if inebriated scares the hell out of me. You can drink all you want...I'll get high on my sugary fruit punch and virgin daiquiris and party with you then shove you into my car and drive you home. Everybody wins. 6. My mother's married name was Lorraine LaRue. I used to tell everyone that was her stripper name. 7. When I was a kid I was obsessed with horses. I wanted to be a jockey. I outgrew it...literally. The second award I received last December was the "Versatility" award, which I received from the lovely Social Lilac over at Papa is a Preacher, who loves the Peanuts and is therefore very cool. Since I've been so horrifically late in posting these awards, I'm giving you a bonus 7 things people don't know about me. Aren't you the lucky ones?? You can thank me later. 1. I carry a fold-up seam ripper in my purse at all times (pocket knives are so passé), because I am just that much of a sewing nerd. Comes in surprisingly handy sometimes, and so far TSA has never blown the whistle on me for forgetting to take it out of my purse. Nail file? Check. Incredibly long and pointy/stabby knitting needles? Check. Mini-seam ripper? Check. Nail Clippers or a 4 oz bottle of shampoo? "OMG you might be a TERRORIST!!!" Isn't illogical bureaucracy fun, boys and girls? 2. My real first name is Mary and I despise it when people shorten it to "Mar." Like 4 whole letters is so long and unwieldy. Yes, I know it's often reminiscent of the Mary Tyler Moore Show. I don't care. Every.single.time. I can only hear "mare" and who wants to be called a female horse? Better than being called a female dog, I suppose, but still. 3. I once sacrificed a Smurf. When I was a kid, I was a bit of a closet pyromaniac and was fascinated by watching flames on candles or in the fireplace. Notice I said "pyro" and not "arsonist." Anyway, I hated the Smurfs on TV because they were stupid and because Smurfette was a bimbette. So one day I found a little plastic Smurf figurine like you might get on a birthday cake from a bakery, took it in the back yard and made a little bonfire out of leaves then stuck the Smurf in the middle. Not long after, my mother informed me that "those who play with matches pee in bed." Um, what?? Apparently my mother thought that lighting candles led to a life of nocturnal urinary dysfunction. Also, if you cross your eyes, they'll get stuck like that. Just thought you should know. 4. Though I've had a few voice lessons here and there and am considered a decent singer now, when I was a kid my father used to turn up the volume on the radio in our car to drown me out and the choir director at my high school once told me to "mouth the words" for a musical I was in. So naturally I did--during rehearsals. For the performances, when there was nothing he could do about it, I sang out (off-key) loudly and with gleeful abandon just because he told me not to. Big mistake, dude...big mistake. Never tell me I "can't" do something, because I will do it just to prove you wrong. I'm contrary that way. 5. Most of the time, I'd rather be in my pajamas. But then who wouldn't? 6. I am an accomplished seamstress. Over the years I have made prom dresses, graduation dresses, children's costumes, elaborate Madrigal/medieval costumes, bridesmaid's dresses, curtains, bedding, and altered clothing, including wedding dresses. I also used to do alterations on the band uniforms for the University of Memphis. (Yay, stinky, sweaty feet!) I once made a Celtic knot wall hanging to enter in the arts portion of my daughter's Irish Dance competitions. It did quite well. Heck, I even re-upholstered a chair for my mother-in-law once...It was interesting, but not something I'd like to make a habit of doing. I'm even considering going back to grad school for a new degree in Historical Costuming. 7. I love British television, whether dramas or Masterpiece Theater or Doctor Who or comedies such as Blackadder and Are You Being Served. I love. them. ALL. And now onto the bloggers I would like to award. I'm gonna be hard-pressed to find 15 who haven't already received these awards, much less 30, so my list is gonna be shorter than it should be. Doesn't matter. Go read these blogs, because they ROCK. 1. Words All Day Thru--she may have awarded me the "Tell Me About Yourself Award, but she just as easily deserves the Versatility Award because she not only blogs about books but other interesting things as well, in addition to helping host multiple podcasts of awesomeness. 2. Professor Dave's Ark In Space. A terribly entertaining group of people presents thoughtful (and occasionally frivolous) commentary on a wide variety of programs and pop culture phenomena on both sides of the Pond. 3. Scandalous Katie is spectacularly cool because she can make people's noses bleed from a distance when sufficiently angered, and because she has a talented iPhone which autocorrects words into works of extreme entertainment value. Also, her kid is obsessed with Doctor Who, so she's clearly doing something right. 4. 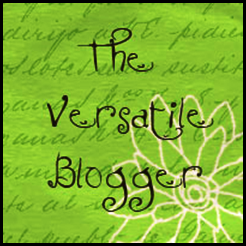 The Adventures of Not Supermom is a very versatile blogger. At last count, she hosts at least 5 blogs that I know about, in addition to being a new host of Doctor Whocast. She writes scathing letters faster than a speeding bullet, has a kid who loves locomotives and can bake more bread than a tall building's worth in a single bound. What's not to love? 5. Diary of a Renaissance Seamstress Someone who creates both Renaissance clothing AND Doctor Who costumes? Yes, please! 6. Crafty Thoughts from Pixie Lynx--Follow my SCA buddy as she writes about her crafty medieval experiments! 7. Been Gardening...Bin Gardening: Follow Dr. K as she writes about her experiments in gardening. I'm not a big gardener myself, but she has some great ideas and she is an outstanding photographer. You should look at her blog just for the amazing pictures, if nothing else. 8. Winnie's Inky Fingers: For all you crafty people out there, check out Winnie's fabulous stamped card pictures for all sorts of ideas. 9. Red Dirt Kelly Recipes and ruminations and other forms of fabulosity. 10. Four Hens and a Rooster I just found this blog, and I can't wait to read more of it. Okay, maybe this isn't 15/30 blogs, but it's a start. Look around, and enjoy them. And thanks for the awards!! Thanks for finding me and thanks for the shout out! Love finding new spirits - especially a g(G)inger! My pleasure! And thanks so much for your kind words!! Ginger: Thank you so much! I am aways for a few days, but I will write on the weekend. I am new to blogging, so I have to read to gather some names to share. Thanks again! You are such a great writer! Thanks! And I totally understand about the gathering names. It's not easy when you're starting out. It's not easy a year later, lol. I hope you have a great trip wherever you're going--I'll look forward to seeing more of your stuff!